I have long been a lover of trees. The northern or “boreal forest” consists largely of spruce, birch and aspen trees, and covers much of Interior and northern Alaska. The silhouetted spruce trees or snow-covered birch trees make a stunning foreground for aurora photography. They are therefore commonly included in aurora photos. next » | 288 sample images from this category. Try a keyword search to see them all. The aurora borealis hovers over birch trees in Fairbanks, Alaska. aurora borealis over spruce trees, Arctic, Alaska. 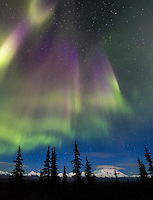 Aurora borealis over the Brooks Range mountains in Alaska's Arctic. Aurora borealis, Koyukuk River, Brooks Range, Arctic, Alaska. Aurora borealis and spruce trees, arctic, Alaska. The aurora borealis over the boreal forest of Fairbanks, Alaska. Moon and aurora borealis over the Brooks Range, Arctic, Alaska. Stream in the Alaska Range, Interior, Alaska. The Northern lights arc over the snow covered tundra in Interior, Alaska. Aurora borealis over mount Sukakpak, Brooks Range, Alaska.